The end of October has marked the book launch of the 8th Those Who Inspire country book. This time, the place chosen to endlessly inspire the local youth and offer them reliable mentors from all walks of life has been the Kingdom of Bahrain. Under the patronage of H.E. Sheikh Hisham Bin Abdulrahman Al Khalifa, The Governor of the Capital Governorate, in conjunction with the Manama Entrepreneurship Week and with the active contribution of the Labour Fund “Tamkeen” as a strategic partner, Those Who Inspire BAHRAIN book was launched on the 22nd of October at the UNESCO heritage site Bahrain Fort Museum. 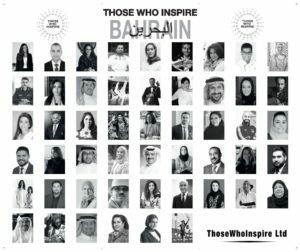 Those Who Inspire Bahrain portrays 51 Inspiring Bahrainis from all walks of life, 26 inspiring women and 25 inspiring men; just to name a few, Shaikha Al Shaiba, Paratriathlete; Dr. Mubarak Najem, Composer & Conductor of the National Band of Bahrain; and Omar Farooq, Filmmaker & YouTuber. The purpose of Those Who Inspire is to empower Millennials and to boldly encourage them to pursue their dreams and, above all, believe in themselves. Giving them with Those Who Inspire Bahrain a book that will allow them to explore a wide spectrum of role models and mentors from their own country. 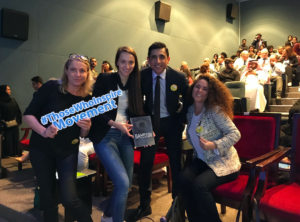 Those Who Inspire BAHRAIN is a powerful tool for Bahraini Millennials for them to learn about experience, mentorship and inspiration… It’s a literal roadmap to the future, paved with storytelling, energy, and life. 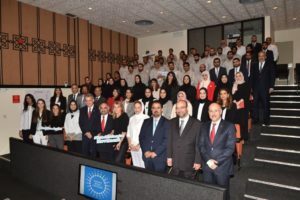 All the Inspiring Bahrainis portrayed in Those Who Inspire Bahrain, renown or unsung heroes, will share their values and beliefs with the younger generations, will commit to act as mentors through one on one mentoring or participating in talks at universities. For Those Who Inspire they donate their greatest resource of all: time. “We know from experience that the right kind of inspiration can change the course of a young person’s life. That’s what inspiration is all about, and we are honoured to facilitate that in any way we can,” says Co-Founder & Publisher Delphine Barets. 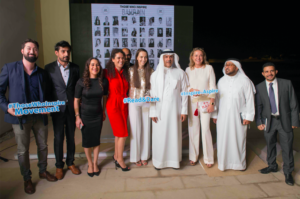 “I just spent around eight months in Bahrain working on Those Who Inspire Bahrain, and I am amazed at how many inspiring Bahrainis I met and how Bahrainis are dedicated to empower their youth,” says Emilia Mirea, Co-Publisher of Those Who Inspire BAHRAIN. Following the launch event on the 22nd of October, TWI started to held talks for the young professionals of some of the partners of Those Who Inspire Movement like EDB and GPIC. The free donation of the books was held by TWI as well to University of Bahrain and Arabian Gulf University organising in total 10 Inspiring Talks so that Bahraini Millennials can exchange directly with some of the Inspiring Bahrainis. TWI donated the biggest amount of books to University of Bahrain. On the 14th of November, 1.200 books Those Who Inspire Bahrain were donated and a morning of inspiring talks will be organised at the Colleges of IT, Business and Arts. Selected Inspiring Bahrainis from the book, such as Huda Janahi, Hamed Fakhro, Fajer Mufeez or Eman Nooruddin, talked to the students about their commitment as mentors of Those Who Inspire Movement. The English Language Centre of University of Bahrain received 900 books to offer to their students as part of the innovative pedagogy for the Foundation Year 2 that will use the book as a tool for their studies for one semester. The Kingdom of Bahrain is also the first place where we have chosen to tell the story of some of our Inspiring People portrayed in the book via short videos (60’). This is only thanks to having met Omar Farooq, Filmmaker and Youtouber, who is behind the production of 5 the short videos that feature IP Fajar Al-BinAli, Huda Janahi, Omar Farooq, Karim Altoobli and Dr Mubarak Najem. Watch all of them here. 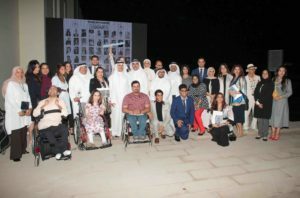 TWI will work on producing more videos for the series Those Who Inspire Bahrain Inspired by Omar Farooq and organising encounters to strengthen the community Those Who Inspire in the kingdom.